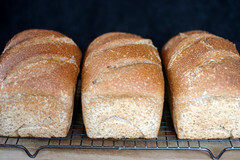 You can begin ordering your loaves on Thursday morning, April 25, for pickup on Wednesday, May 1. Please sign up for our email bakery bulletin on the left margin of this page, so you know when you can begin ordering each time we bake. And if you do sign up, make sure that the bakery emails aren't getting caught in your spam-catcher. See our long-term baking schedule to see what we are baking each month. Questions? email me: alison@riseandshinebread.com or give me a call at (907) 312-0592. Our daily bread, and the foundation of our diet. 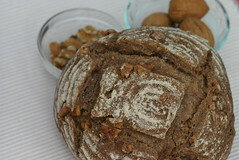 We eat this bread every day for breakfast toast, for lunch sandwiches, and for dinner as toast with soups or stews. The long, cool-risen sourdough in this delicious and nutritious loaf gives the bread a flavor complexity and moistness (not to mention keeping quality) that you won’t find in a commercially yeasted dough—especially one with no added oil or sweetener. Our next ordering period begins Thursday morning, April 25. 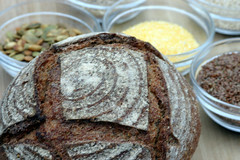 What could possibly make our 100% whole wheat levain better? I love the complex, tangy flavor and the nice keeping quality already—it’s the bread I eat every day. But what about adding Alaskan potatoes to it? This big beautiful pan loaf is basically the same bread as the levain, but with an added moistness and tenderness and keeping quality that comes from the potatoes. Great for toast, sandwiches, bruschetta, croutons…. you can use it with sweet or savory toppings. It’s the ultimate multi-purpose bread! 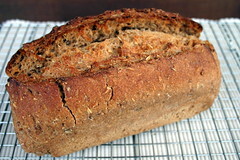 This 100% whole wheat pan loaf is loaded with grains used for brewing beer at the Midnight Sun Brewery. These mixed grains still have plenty of flavor left in them even after the brewers are done with them. They add both a malty sweetness and lots of texture to our organic 100% whole wheat flour, and the flavor of the grains added will vary subtly, depending on the type of beer brewed. Whether you have resolved to eat more whole grains in 2009, you like the idea of reducing, reusing and recycling, or you just want a hearty and flavorful bread for breakfast toast and sandwiches, our spent grain bread will be sure to please! Packed with huge chunks of rich, toasted walnuts, this loaf is unbelievably good as toast with a slice of cheese melting on top. It’s also great just by itself as breakfast toast, or drizzled with honey. The bread is made with 100% whole wheat, so a slice or two of breakfast toast will last you all morning. And in addition to toast, you can use it for sandwiches or a hearty dinner bread with a bowl of soup. As much as I love our regular 100% whole wheat levain, I have to admit that the toasted seed is maybe my favorite. 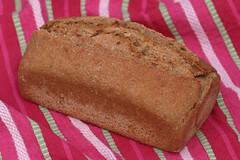 This loaf has the added richness and toasted flavor of a variety of organic seeds! Flax, sesame, pumpkin, sunflower, and a little polenta... it's packed with good things! And it’s just as versatile as our regular signature 100% whole wheat—you can use it for toast, sandwiches, or dinner bread—and it’s just as healthy, since it’s also made with 100% whole wheat. It’s wonderful sliced, toasted and dipped in olive oil and salt—just add a salad or a soup for a great meal any day! 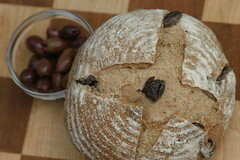 Our olive bread is so loaded with Greek olives that even when I’m cutting small pieces to share for samples, there is an olive in every bite. A little olive oil in the dough makes the crumb especially soft and luscious; it might just be the perfect dinner bread. To reheat the bread and make the outside crusty again, just pop the unwrapped loaf in the oven at 350 degrees for 15 minutes before you sit down to eat. Or you can just toast slices individually if you won’t be eating the whole loaf at once. 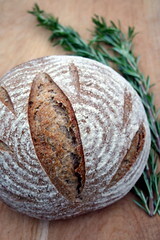 Adding fresh rosemary to our hearth loaf gives it a savory herbal flavor that goes so well with lots of different foods. Decorated with leaf-shaped slashings on top, it’s quite beautiful, too. If you’re using it for a dinner bread, just heat the unwrapped loaf in a 350 degree oven for 15 minutes to get a beautiful crisp crust on it before you sit down to eat! Everyone’s breakfast favorite, it’s perfect for toast. 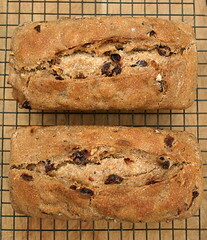 This hearty little loaf is so packed with toasted pecans and moist, naturally sweet organic raisins that it hardly needs butter or honey. And the whole wheat flour keeps you going until lunch! Have you ever eaten a hot cross bun at Easter time? Packed with fruits and toasted nuts, our fruited almond loaf is partially inspired by the rich hot cross buns my mom made when I was small. Our loaf, though, has neither eggs nor butter in it, making it a healthier choice—you can eat slices for breakfast, afternoon snacks or dessert and still feel virtuous! The long action of the sourdough on the whole wheat flour gives the bread a flavor complexity and keeping quality that doesn’t require butter or eggs. 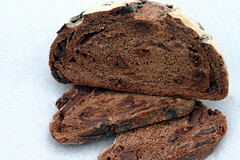 And the bread is packed with dried fruit and scented with almond extract, further enhancing its moist and delicious flavor. 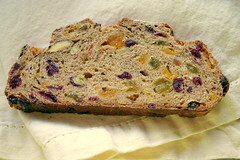 We’ve included a combination of our favorite dried fruits: apricots, golden raisins, and dried cranberries. The colors are lovely, making it beautiful on a dessert plate as well as for your breakfast toast. We think this bread tastes even better than chocolate cake—and it doesn’t contain any butter, eggs, or dairy. But it’s packed with the important stuff: dark and rich gourmet cocoa powder, big hunks of dark chocolate, and dried cherries. If you put a piece in the toaster for a minute or two, the chocolate chunks get all melty and luscious and you’ve just made yourself a little slice of nirvana. 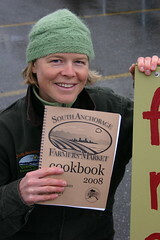 ingredients: The South Anchorage Farmers Market Cookbook is filled with 100 pages of delicious, healthy recipes that showcase our flavorful, fresh local Alaskan produce. Recipes provide inspiration for ways to use Alaskan vegetables, fish, fruits, bread, and other products that can be found at our farmers markets. Mostly vegetarian and vegetable recipes, many of which are dairy- and egg-free, the cookbook focuses on recipes that have fantastic flavor and top-notch nutritional value. The directions in each recipe include lots of hints about how to prepare these recipes with speed and efficiency. The cookbook also includes directions for processing Alaskan produce to freeze for the winter.